In continuing our series of articles on what some of the new v4 features are, here is a preview of another new v4 feature. 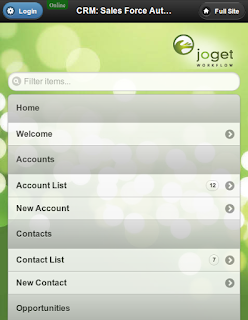 Our vision of Joget Workflow to be a platform for building process-centric web app also extends to the mobile web. In this next release, our goal is to enable all apps built on the Joget Workflow platform to be automatically supported on the mobile device. We are currently tinkering with PhoneGap to achieve this.. :-) The development of this feature is currently in internal beta stage. Will share more on this later. I would think Joget move towards enabling thre mobile platform is very good. This will enable people like me to extend more solutions via mobile joget to my clients.